This week I thought I would try drinking more water. Somewhere in the back of my mind I know it can help with weight loss, and that's what it's all about. Trying new things to see if they help or hinder. I plan to drink at least a litre of water on top of any other fluids. I have been good this week and only had one hiccup. I went for lunch with an old friend and ordered grilled chicken with avocado and bacon. I asked for salad in place of the fries and coleslaw. What I got was a few rocket leaves with tomatoes, a brioche bun (? ?where did that come from??) with FRIED chicken. Yes I did eat it but I left the bun and the avocado. The avocado was going to be my treat but I just couldn't eat it once I saw the chicken covered in oil. Too many Syns. Did drinking more water work? I think it helped as I lost 1.5lbs this week.That was even after eating fried, not grilled chicken and having red wine on my birthday. I didn't have cake, I want to lose weight more than I want to eat cake. 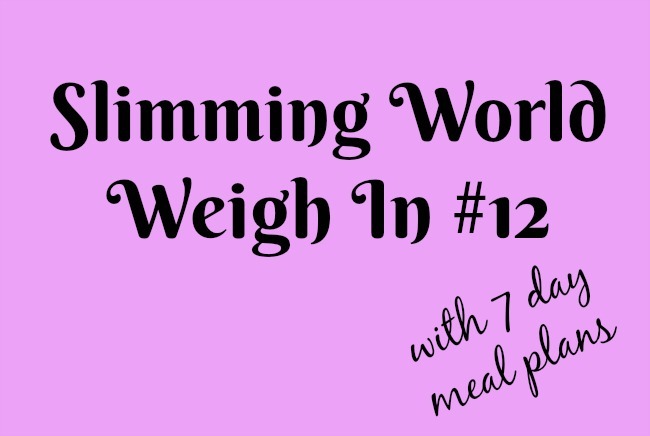 I am going to add a little exercise in this week and see if drinking water and doing more exercise makes a difference. I'm not going to go crazy, just some exercises and more walking. Maybe clean the dust from my exercise bike and do some cycling too. I keep reading that quark mixed with Options (chocolate based instant hot drink powder) is lovely and makes a delicious dessert. So I tried one. I mixed Belgium Chocolate and praline with quark. It tasted awful, truly awful. I will try with other flavours and if I find one that is tasty I will let you know. I have decided to just stick with having two boiled eggs for breakfast with a piece of fruit and keep my healthy extras for later in the day. Most evenings I do fancy a snack so if I haven't already eaten my healthy extras then I can have a piece of cheese and 5 Brazil nuts. It's also great to have them in hand for some Parmesan cheese on pasta, or a wholemeal roll with a burger. 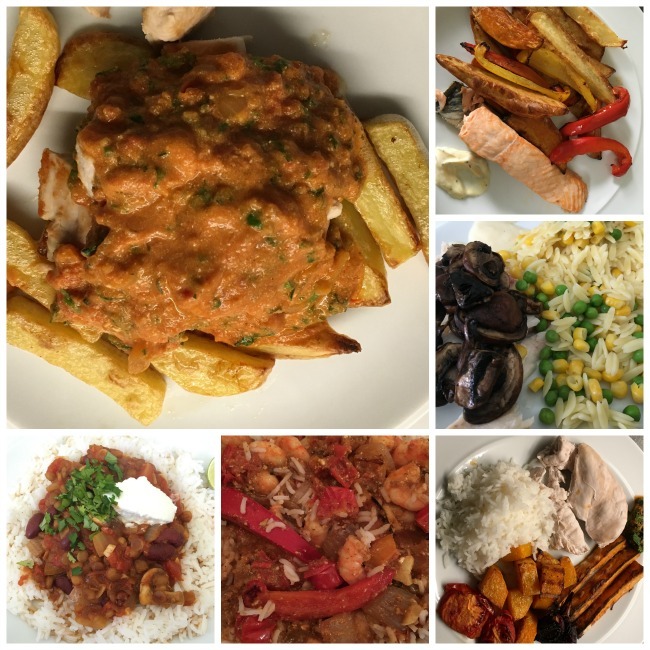 Main picture; Chicken and chips with SW chip shop curry sauce; Top going anti-clockwise; Salmon with potatoes and peppers; Cod with mushrooms and rice with peas and sweetcorn; Chicken, rice and roasted vegetables; Prawn Jalfrezi; Vegetable chili with rice. 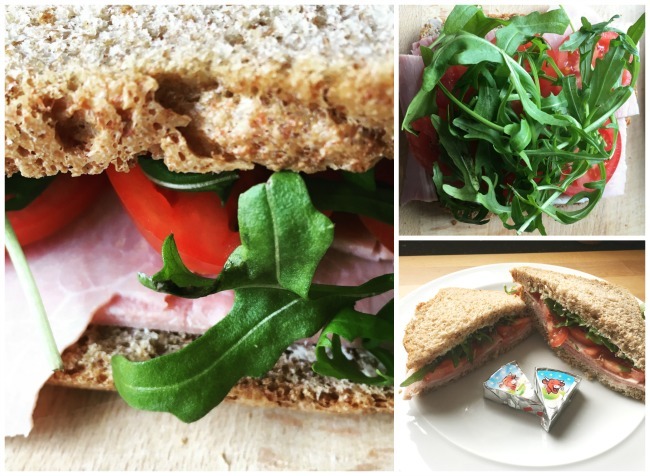 For lunch on Monday we needed something quick and so we had a ham sandwich. I used my healthy extras for the wholemeal bread, spread 2 triangles of Laughing Cow Light cheese spread on the bread instead of butter. This is also a healthy extra and I could have used more, in future I would use two triangles on each slice of brad as it tasted really good. I sliced a tomato and piled on rocket. It was quick, tasty and totally Syn free. We have had some lovely meals this week. The Prawn Jalfrezi was delicious and so was the Vegetable Chili but my best recipe of the week is Slimming World Chip Shop Curry Sauce. OK it's not anything like the sauce you actually get in a chip shop but it is truly yummy and we will definitely be having it again. If you would like some more meal ideas I have just started an instagram feed that features pictures of Slimming World friendly meals. Why not pop over and have a look? SlimmingWorldWithCardigan.